Steven graduated from the Cleary School. For one semester he attended a hearing school in Hicksville but was frustrated depending on lip reading. When Steven was 13 he transferred to Fanwood, New York School for the Deaf in White Plains, NY, where he finally learned sign language. He did well and was able to attend college at Gallaudet College in Washington D.C. (now Gallaudet University.) He graduated with a bachelor’s in Library Science. He has lived Maryland suburbs of D.C. ever since. While Steven was at Fanwood other students told him he had tunnel vision because he often overlooked their waving of hands to get his attention. He took offense at their statement and was in denial until a visit to an eye doctor confirmed it. The doctor did not tell him he had Ushers Syndrome, however, since perhaps at the time it was not a well-known condition. Now Steven’s vision is limited to light perception in one eye. He cannot make out faces or signs, and he relies on the tactile mode of sign language. Steven’s encroaching loss of peripheral vision and night blindness did not prevent him from learning to drive or from getting a job at Gallaudet as a librarian, or traveling. He drove for about 15 years before giving up his license due to vision loss. He worked at Gallaudet for 25 years before being forced into retiring on disability. Although he was forced into retirement he remains fond of Gallaudet and is still a supporter of the university. In 1983, Steven met his life partner Ed and as of 2016 they have been together for 33 years and married for 7 of those years. Ed is hearing and Steven taught him ASL. They live in Rockville, MD. Steven has one daughter (hearing) by a relationship from prior to his meeting Ed. This was an open adoption situation. Luckily the adoptive parents (wonderful people!) were always supportive of Steven being in contact with his birth daughter. He and Ed keep in touch with his birth daughter, son-in-law and their five-year-old son. His birth daughter knows some ASL and signs tactile with Steven – and she is teaching her son to do the same. In the 1990s Steven made a number of adaptations to going blind. First he learned touch-typing since he knew that “hunt and peck” typing would not suffice for a blind person. Then he learned how to use a white cane through Orientation and Mobility training. He adapted his computer by using ZoomText to enlarge what was on his monitor. He educated himself about Ushers Syndrome and became active in the DeafBlind community, and served a term as president of Metro Washington Association of the DeafBlind (MWADB). He received several awards from MWADB and an award from the Family Services Foundation. Steven acquired a CCTV to magnify written material to help him pay bills and read the paper. He switched his bills to direct pay so he would not have to write checks. He got a NoteTeller device to signal by vibration the denomination of bills. He also got a vibrating signaller for his doorbell. Steven started to learn Braille with the Maryland state Department of Rehab Services in 1998. In 2001, Steven resumed learning Braille via a correspondence class at the Hadley School, while he still had enough central vision to use his computer visually for email using ZoomText. The teacher would mail him Braille homework assignments and he would answer by email. He got an A in Grade One and also an A in Grade Two. Later he got a brailler to emboss files from his computer into Braille, and a refreshable Braille Display, which he learned how to use at the Helen Keller National Center on Long Island. He also uses a Braille TTY device to independently place calls via Relay. For instance, he uses this system to make paratransit reservations and to contact his travel agent to plan trips. In 2001, at the age of 55, Steven lost his central vision and began to rely entirely on the sense of touch to communicate. Steven bought a Braille embosser in July 2007 so he could print from his computer to Braille. Steven attended the Helen Keller National Center on Feb. 2008 for three weeks of computer training. However, HKNC was closed for a portion of that time due to a snowstorm and President’s Day. Steven got funding from the Community Services of the Deaf to attend HKNC for two more weeks in Nov. 2010 and he learned how to open attachments, reply, check the computer clock, etc. Steven is exceptionally well organized, a trait that served him well as a librarian, and even more so as a blind person. He also has a remarkable memory. Steven regularly attends a synagogue in DC that provides him with a team of ASL interpreters comprised of a certified hearing interpreter and two deaf interpreters who copy-sign into tactile for Steven, taking turns. Steven enjoys attending the DeafBlind Camp of Maryland that usually last four or five days. Steven often speaks at interpreter training programs to explain about his life as a DeafBlind man to interpreting students. Steven also enjoys attending a DeafBlind Shabbaton outside of Baltimore. Steven has often attended the conferences of the National Association of the Deaf and Deaf Seniors of America; they provided SSPs and interpreters. Steven has attended several deaf blind camps in other states. Steven gave up CCTV magnification in 2010 and donated his CCTV to Deaf-Blind Camp of Maryland where Deaf-blind campers can use it each year. Steven often travels by airplane without a companion on the plane, using a system of index cards with messages written in both written English and Braille. If necessary, Steven teaches the airline personnel how to communicate with him using Print On Palm, which involves tracing block letters in the palm of his hand with your index finger. Steven has also at times served on the Elderly and Disabled committee of the Washington Metro system and currently serves on an accessibility advisory committee at the Montgomery County MD library system. Once Steven attended the World Federation of the Deaf-Blind in Finland, where he met other deaf blind people from around the world. Steven has attended numerous conferences of Foundation Fighting Blindness and has participated in Vision Walk fundraising. Steven has also attended the DeafBlind World Expo. Steven stays connected with his friends via Facebook and email. He recently got his first Braille notebook and now when he travels he can connect to wifi and read Facebook while on trips. 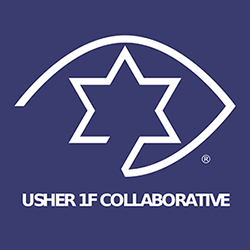 Steven recently learned from University of Iowa that he has Usher 1F, which is what we expected because he is of Ashkenazi heritage. For many years Steven has kept meticulously organized photo albums of all his travels and hopes some day to be able to view them again. There are many trips he has gone on in the past 15 years with Ed or other friends who took photos and videos, and he is keeping those photos and videos in the hopes that one day he will be able to see those places he traveled after losing his central vision. Although Steven gets the most out of life – perhaps more than the average hearing-sighted person – life is not easy and Steven is still hoping for a cure that will restore his vision some day. He would love to see his grandson’s face.  A copy of the latest financial report, registration filed by this organization and a description of our programs and activities may be obtained by contacting us at: Usher 1F Collaborative, 321 Walnut Street, #228, Newtonville, MA 02460. If you are a resident of one of the following states, you may obtain financial information directly from the state agency. Florida - Registration #: CH51961 - A COPY OF THE OFFICIAL REGISTRATION AND FINANCIAL INFORMATION MAY BE OBTAINED FROM THE DIVISION OF CONSUMER SERVICES BY CALLING TOLL-FREE (800-435- 7352) WITHIN THE STATE. REGISTRATION DOES NOT IMPLY ENDORSEMENT, APPROVAL, OR RECOMMENDATION BY THE STATE. Georgia – A full and fair description of our programs and our financial statement summary is available upon request at our office and phone number indicated above. New Jersey – INFORMATION FILED WITH THE ATTORNEY GENERAL CONCERNING THIS CHARITABLE SOLICITATION AND THE PERCENTAGE OF CONTRIBUTIONS RECEIVED BY THE CHARITY DURING THE LAST REPORTING PERIOD THAT WERE DEDICATED TO THE CHARITABLE PURPOSE MAY BE OBTAINED FOR THE ATTORNEY GENERAL OF THE STATE OF NEW JERSEY BY CALLING 973-504-6215 AND IS AVAILABLE ON THE INTERNET AT: http://www.state.nj.us/lps/ca/charfrm.html. REGISTRATION WITH THE ATTORNEY GENERAL DOES NOT IMPLY ENDORSEMENT.